This article is a short summary of Mario & Luigi: Bowser's Inside Story. Mario ando Ruīji Ārupījī Surī!!! 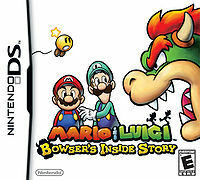 Mario & Luigi: Bowser's Inside Story is the third game in AlphaDream's Mario & Luigi series of Super Mario spin-off role-playing games, released in 2009 for Nintendo DS. While the game makes use of the Nintendo DS's features, the main new gameplay mechanic is the addition of Bowser. When Bowser inhales Mario and LUigi, the bros must power up their nemesis fro the inside to save the Mushroom Kingdom from Fawful in the most hilarious game yet of the celebrated RPG series! Bash, burn, and battle as Bowser! Exploer the 2-D world inside Bowser! Fight and level up the bros! Mario™, Luigi™, & Bowser™ team up on a wild adventure! In his evil plot to take over the Mushroom Kingdom, Fawful tricks Bowser™ into eating a magic mushroom. The mushroom causes Bowser to begin inhaling everything around him, including Mario™, Luigi™ and Princess Peach™! Do the Mario Bros. have the guts to rescue Peach and escape? Players are in control of two separate storylines. One features Bowser and his efforts to stop an arch-villain from taking over his castle. Meanwhile, inside Bowser, the microbe-sized Mario & Luigi must muscle their way through challenges and keep their nerve if they want to find a way out. They take action to control Bowser from the inside – but without his knowledge. Players can switch between storylines at will. What happens inside Bowser affects what he’s doing on the outside. Sometimes Mario & Luigi must solve puzzles and challenges behind the scenes to help Bowser overcome various obstacles and advance the plot. Players must make well-timed button presses to enhance their performance during battles and challenges. In some battles, Bowser grows so large that players must turn their Nintendo DS or Nintendo DSi™ system sideways, blow into the microphone or tap on the touch screen with the stylus to keep up with the action. The game features the same hilarious dialogue that has been the hallmark of the Mario & Luigi series. A disease called the Blorbs has been spreading across the Mushroom Kingdom, and Peach has called together an emergency meeting to discuss the situation. During the meeting, Bowser shows up, but is beaten and thrown out of the castle, into the forest nearby. Once he recovers, Bowser is tricked into eating a Vaccuum Shrooom by Fawful, which causes him to start uncontrollably inahling everything around him. He then returns to Peach's Castle and inhales everybody present, while Fawful and Midbus take over both Peach and Bowser's castles. Mario and Luigi find themselves inside Bowser's body, and must help him out as Bowser goes to take back his castle while also trying to find a way out, and later all three must stop Fawful from reviving the Dark Star to take over the world. While the game makes use of the same mechanics of past games, players switch between playing as Bowser in the overworld on the top screen, using the X and Y buttons, and Mario brothers through 2D seggments inside Bowser's body on the bottom screen, replacing the Baby Mario and Luigi system of the previous game, Mario & Luigi: Partners in Time. At many points throughout the game Mario and Luigi must travel through parts of Bowser's body in order to help Bowser progress, generally through the use of minigames, though they also unlock new abilities that allow them to progress. Battle mechanics remain similar to the previous games. While Mario and Luigi retain their jump and hammer attacks, Bowser's attacks allow him to punch and breath fire. Bowser can also use his suction ability in battle, which allows him to swallow small enemies so that Mario and Luigi can battle them. In addition, while Mario and Luigi's special attacks require gathering puzzle pieces and use the buttons, Bowser's attacks require him finding minions on the overworld and use the touch screen. Finally, at some points in the game Bowser grows to a giant size in order to battle massive enemies; while Bowser keeps his same attacks, these battles also make use of the touch screen. This page was last edited on 3 November 2018, at 22:45.